The book is called The Snow Queen, and it’s by Hans Christian Andersen (and it’s translated by Misha Hoekstra). It’s about a boy and a girl who are best friends. Then, one of them gets glass in their eye from a magic mirror, and the Snow Queen takes him away! After that, the girl has to go and save her friend without her shoes (because she dropped them in the lake… long story!). My favourite part was when the girl freed the boy, and they went back home and lived happily ever after! No, I just didn’t like it much. It was one of those splinters of glass from the shattered mirror, the Devil’s mirror. You remember – the terrible mirror that turned anything great and good into something puny and ugly – the glass that made anything plain or evil look bigger, that made every blemish or mistake stick out. And a splinter had gone right into his heart too. Soon it would become just like a lump of ice. The splinter no longer hurt – but it was there all the same. Once again, Pushkin have assembled an excellent team for the job. Some of you may remember Hoekstra from his translation of Dorthe Nors’ Minna Needs Rehearsal Space, and illustrator Lucie Arnoux also worked on In Their Shoes, another of Pushkin’s fairytale volumes. Throw in a large, clear font and a beautiful cover design, and you’ve got a book worthy of any beginner’s library. 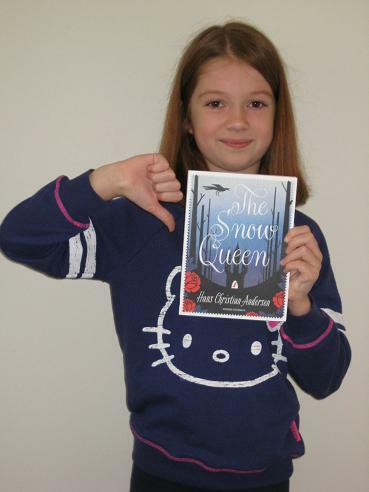 Lovely review Emily – I love how you are so honest about this book and your reaction to it. Thank you for taking the time to share your thoughts with us. Sharkell – Emily is very happy for the comment (even if she wasn’t so keen on the book! ).